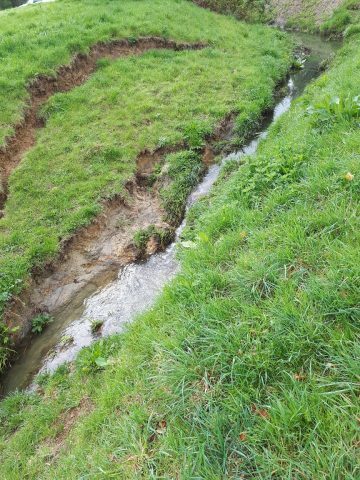 We have been monitoring the banks of the Wotton Brook over the winter months and have noticed some large cracks and bank slippage into the water channel. It is particularly bad along the stretch from Bird Road to Hathorn Road. 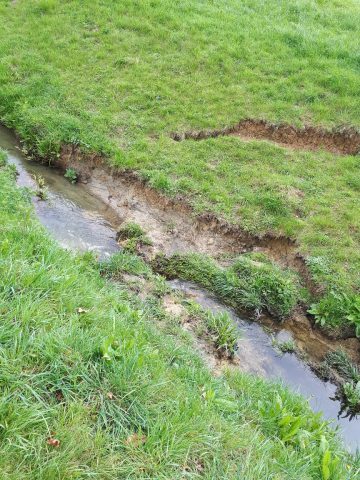 This has been reported to Tewkesbury Borough Council and they have obtained quotations to repair the banks. A contractor has been appointed and will commence works shortly. The contractor will be enlarging the channel at this area and re shaping the banks to take some of the weight out and make it less steep. The contractor will then pin a GEOCOIR netting to help stabilize the banks, before placing soil on top and re grass seeding. Please note they do not intend to take any soil away from site as removal and tipping is expensive. The contractor under supervision will endeavour to make the area look as neat and tidy as possible, however it will look a bit bare at first until grass re-establishes.